This drawer is in my island counter. It's the perfect height for the boys to help themselves. I was so excited when I tried these baskets in the drawer. They fit PERFECTLY! They are the same basket I used in my kitchen command center, just a different color. Wow! I am amazed at the bins and baskets a person can find at the Dollar Tree and the great thing is they are so inexpensive! AFFORDABLE Delightful Order! ... I LOVE it! 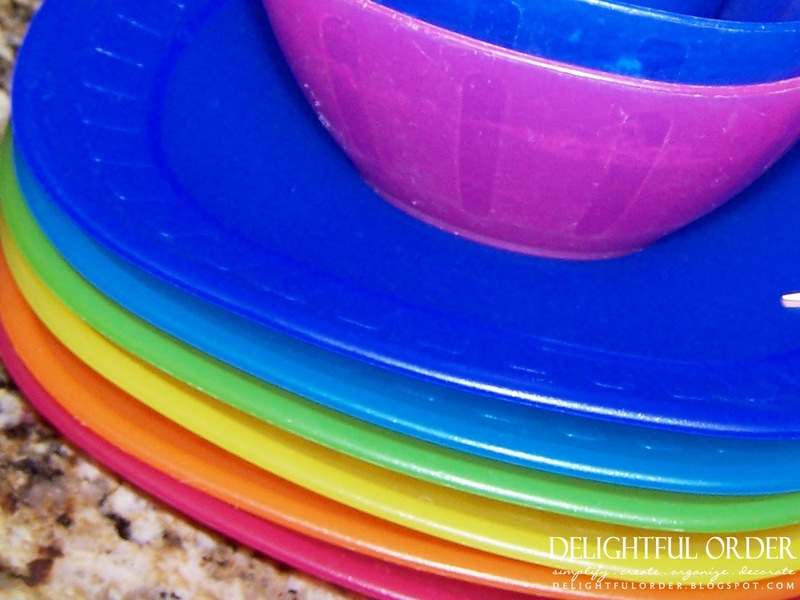 These plates, bowls and cups are from Ikea - they're just the right size for little ones! My boys unload the dishes each evening, after dinner. You may remember seeing that on their CHORES charts. Now, as they unload, they can see exactly where everything goes. I may have made their job a bit harder, because NOW they have to put the items into the proper bin, instead of just chucking everything into the drawer. BUT NOW it's so much easier to find things and it feels a little more like it's in Delightful Order. You may have noticed the paper plates are no longer in this drawer. I created a new home for my paper tableware. Post on that coming soon. So tell me, do you have a specific drawer or cabinet or a certain place you keep all your children's cups, plates and bowls? How does it work for you and your family? I wish I had a drawer like that in my kitchen! All I have is small drawers and cabinets. 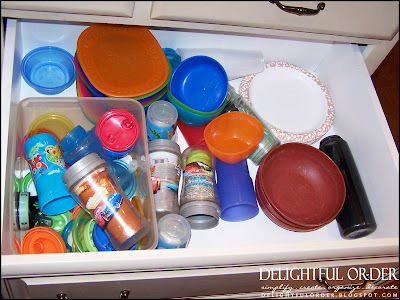 I'm currently trying to figure out how to organize a cabinet for my kids to keep their plates and cups in. The way you organized this is AWESOME though! Oh my goodness, this is amazing! I have the same plates and cups and also an island with deep drawers. 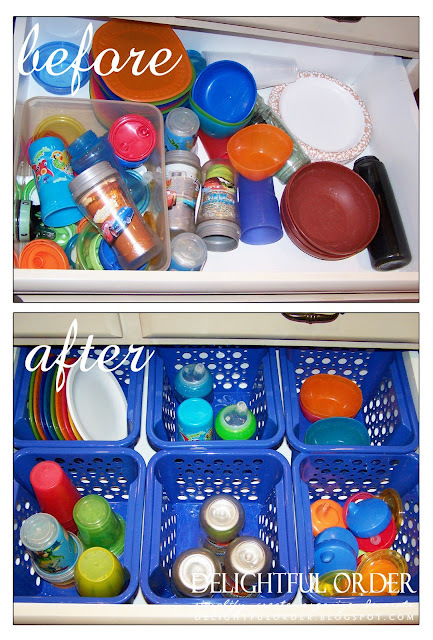 Sippy cups are taking over my valuable cabinet space - I LOVE THIS! Headed to dollar tree now! Thank you for sharing! I totally love this idea!! I have been stuggling with this too. I have all of kids stuff scattered through the kitchen and I am always having to get there plates and cups...thanks for the idea!!! I too, have the bowls, cuos and plates from IKEA...love them!!! I will have to try something like this but incorporate it in the cabinet. We don't have any of those lovely deep drawers so the 'sippy cups and etc's' go in the small cabinet by the sink. Thanks for sharing! I wish I had a "kid's drawer". :) This is such a great idea! My little one's cups, bowls, plates, and utensils are in an upper cabinet next to our fridge. It works well for right now but in the future I'd like to make it easier for him to get to things on his own (as well as put things back on his own). I have all of my kids stuff in cabinet. I have the cups on a shelf and the lids in a basket from Dollar tree. The inside part of the cups (rubber stopper things) are in a small butter tub (repurposed). This works great for now (boys are still to little to use stuff without us.) This is great because if we have people over and open a regular cabinet we don't look like we are over run with kid stuff. You have really inspired me, today I went and purchased baskets for my pantry to re-organize it next week. And, I have started using your week at a glance page, thanks so much for all the info! Looks nice! You did a grat job. It does look pretty as well as functional. Love it! Thanks for the great ideas. I found this blog from a linky party. We keep the kids things all over the kitchen and it seems to be a big mess. I've been meaning to reorganize the kitchen to make it work better and I'm going to use some of your ideas. I just found your blog and am your newest follower. This is a super fab idea! Thanks for sharing and creating such an inspiring blog (your home is like my own little organizational heaven!! Love! And will be checking out my local dollar store for some baskets! You are seriously incredible! I just love reading your blog! I just went to the dollar store to buy some baskets. I've been meaning to get to the kitchen for a while and I'm so glad I did! we have a 'sippy drawer too" fun post! OMGosh, this is the ANSWER I need!!!! I'm so in love with this! Thanks so much for sharing! Applied this idea to my drawer yesterday... Thanks so much! You can take a peek here. 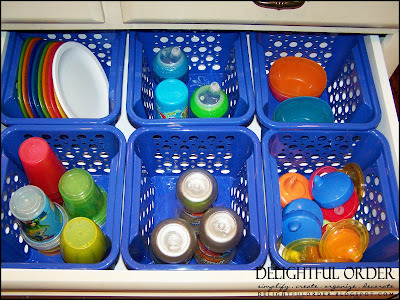 Thank you we are just about to enter the sippy cup stage....and I will be implementing your sipper drawer idea. Oh I know I'm late in the game here, but I just saw this on Pinterest, and I will be making a trip to the dollar store maybe even today. This is FANTASTIC! My boys unload their own dishes as well as set the table with their own dishes, and I'd LOVE for them to have something more organized to use! We currently use a big deep drawer just like this (of which I will be taking measurements before I go to the dollar store), so hopefully I can create something very similar! THANK YOU!